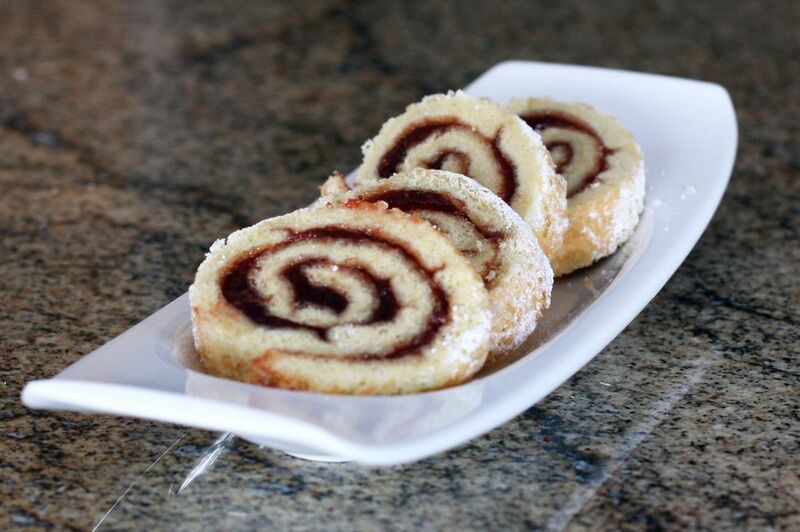 This sponge cake roll can be filled with cream or ice cream, or use your favorite filling. Lemon curd or a jam filling would be delicious as well. Beat egg yolks until thick and lemon lemon-colored; gradually add 1/3 cup of the granulated sugar, the lemon juice, and the lemon zest. In another bowl, beat egg whites until almost stiff; gradually beat in the remaining 1/3 cup sugar. Beat until stiff peaks form. Fold yolk mixture into the beaten whites. Sift dry ingredients into a separate bowl; add to egg mixture, folding in carefully. Fold in melted butter. Pour batter into the parchment paper-lined 10x15x1-inch jelly roll pan. Bake at 375 F for 12 minutes. Turn onto a clean kitchen towel which has been generously dusted with confectioners' sugar. Trim edges, if necessary; roll cake up, towel and all, while still warm. Let cool completely. Unroll and fill with whipped cream or ice cream, lemon curd, or a​ blueberry lemon curd, or a layer of jam and a thin layer of whipped cream or whipped topping. Re-roll the cake and slice to serve.